Why do fascists want to burn down REVOLUTION BOOKS? At UCLA, political protests are being targeted and Revolution Club members and Refuse Fascism activists have repeatedly been arrested. At the University of Chicago, a Revolution Club member was brutally arrested for participating in a silent protest supporting immigrants. In Washington, DC, two Refuse Fascism activists were arrested by the Secret Service for reading a proclamation, then a family member was visited by Homeland Security. Fascist thugs—the Trump/Pence regime’s unofficial storm troopers—threatened to burn down Revolution Books in Berkeley, and a fire was set outside a radical/progressive bookstore in San Diego. Meanwhile, online Nazi trolls attacked and temporarily shut down the refusefascism.org website. These are some of the signs of a dramatic, at least in some respect coordinated, escalation of state repression targeting opponents of the Trump/Pence regime over the past several weeks, in particular Revolution Clubs and RefuseFascism. Just as significantly—perhaps even more so in the potential it revealed—in each of these instances, those targeted for attack refused to buckle under or back down. They stood strong and doubled down: widely publicizing the fascist attacks and exposing what they show about the whole Trump/Pence regime, and calling forward broader support—including in some instances media and social media coverage reaching millions. February 12, UCLA. The Revolution Club, LA went to UCLA where the mayor of Chicago, Rahm Emanuel, was invited as a “thought leader” to present about what he has done to supposedly help the people of Chicago. When club members verbally exposed his lies and assaults on the people, campus pigs grabbed one member and wrenched on his shoulder to stop him from chanting “Trump and Pence must go” and calling on people to go to revcom.us and to find out about Bob Avakian. They slammed him to the ground, and later charged him with two misdemeanors. Two other members of the Revolution Club were taken into custody for filming the police as they brutalized him, and were released without charges. February 26, UCLA. Two Revolution Club members and a Refuse Fascism activist were dragged out of Treasury Secretary Steve “The Mouse” Mnuchin’s talk, which many in the audience were vocally protesting, because they dared to stand up and call out his lies and crimes. As the event was letting out, two other members of Refuse Fascism and the Revolution Club were arrested for speaking out against this regime and these outrageous arrests. Rather than intimidating the revolutionaries and activists, it spurred them to step up their exposure and opposition to these powerful, yet also pitiful, fascists. Mnuchin begged UCLA to suppress its video of the event, but cell phone videos of the Revolution Club being assaulted by police went viral—including because of the efforts of Refuse Fascism and others—they’ve been seen over 1.5 million times—and the protest and Mnuchin’s efforts to censor the video were widely covered in the press including the New York Times, Washington Post and many other sites. Meanwhile, the Revolution Club members who were targeted issued a debate challenge to “The Mouse,” which was spread by refusefascism.org, Revolution/revcom.us, and others. March 1, University of Chicago. University of Chicago police brutally attacked and arrested Maya, a member of the Revolution Club, Chicago, as she left campus after participating in a SILENT protest in support of undocumented immigrants in the student center, where almost the entire dining hall fell silent for 11 minutes in support of 11 million undocumented immigrants. On top of this outrageous attack, they are now charging HER with felony battery on a police officer and resisting arrest. She was then further targeted by the state at what should have been a routine bail hearing when the assistant state’s attorney presented a lengthy, distorted, and utterly irrelevant political dossier on Maya, implying that she should not be released—on the basis of her alleged political views and associations. The Revolution Club and others in Chicago spread word of these outrages and built support for Maya, and her March 8 court hearing was packed with 25 supporters. At the hearing, the prosecution outrageously decided to forego this preliminary hearing with the judge and take the case to a grand jury, to avoid having his one witness—a pig—crossexamined by Maya’s attorney. Her next court date is March 26. In short, the repressive power of the state—in close cooperation with the university—was brought to bear and bring serious charges against someone peacefully protesting the ongoing raids against and attacks on immigrants. 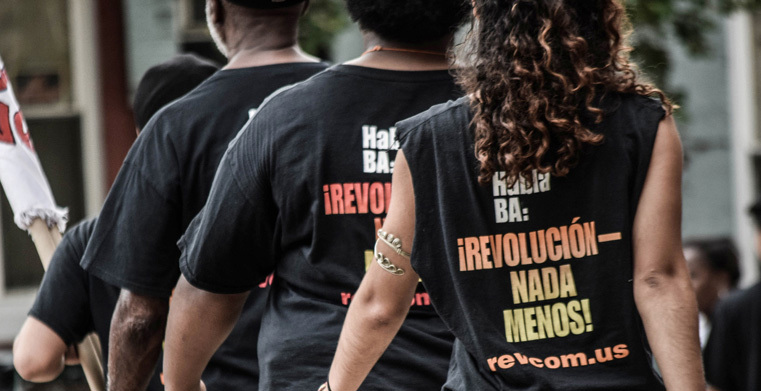 Revolution Books has repeatedly stood firm and made clear it will not be intimidated or shut down, but will carry out its core mission with more determination. (When one MAGA-moron asked a store staffer, “Why am I a white supremacist?” the staffer responded, “I don’t know, why are you a white supremacist?”) The bookstore energetically publicized video of this outrageous threat and it has been shared and spread very widely—including by The Young Turks, Publisher’s Weekly, and Britain’s Independent. A NowThis Politics Facebook video has so far been viewed over 2.4 million times, and many powerful support statements have been posted on Revolution Book’s Twitter feed. Revolution Books has called for people to come support the store and held a well-covered press conference. And it has seized the moment to contrast the racist, misogynist, know-nothing/have nothing but horrors to offer humanity of the fascists, with the knowledge, vibrant engagement, and pathway to a liberating future found at Revolution Books. Amidst all the talk in the liberal media about the “chaos” in the Trump White House, there was no chaos in this coordinated, nationwide assault on Refuse Fascism activists and the organization itself. March 5, UCLA. Meanwhile, in Los Angeles, Tala Deloria, the UCLA student who can be seen in the February 26 video being carried out of Steve Mnuchin’s event, was arrested yet again at UCLA while standing in the lobby of a public event on the UCLA campus. The police claim she was violating an illegitimate seven-day ban from campus which they had conveyed verbally during her first arrest. Deloria can be seen in this video issuing a challenge to Steve “the Mouse” Mnuchin to debate her and the others who were arrested during his February 26 UCLA speech. This video went up on March 5—six hours before Deloria was rearrested. In short, a verbal challenge to Treasury Secretary Steve Mnuchin to debate has been turned into a crime to be targeted for political suppression, arrest, and political snooping by Secret Service, police, and the Department of Homeland Security. These attacks mark serious escalations against basic rights of the people to politically protest. Attacks on basic political rights are a core element of fascism and such basic rights must not be surrendered. Surrendering and allowing these kinds of illegitimate arrests and assaults paves the way for the consolidation of the open, society-wide terror of fascist rule. So these attacks must be met head on and defeated. Key in doing so is by reaching out very broadly for support while at the same time refusing to be backed down, and exuding the righteous spirit of contempt for the monsters now running the U.S. and threatening the whole world, a spirit modeled in the challenge to the pitiful Steve Mnuchin to debate. 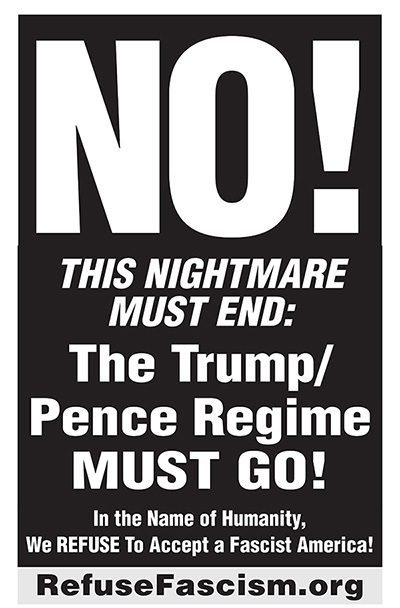 All this must be done in the context of further spreading the message that these courageous activists and revolutionaries were conveying—exposing the cruel and fascist program of the Trump/Pence regime and all its minions, spreading Bob Avakian’s talk, THE TRUMP/PENCE REGIME MUST GO! In The Name of Humanity, We REFUSE To Accept a Fascist America, A Better World IS Possible, far and wide, and stepping up efforts to organize millions to drive this fascist regime from power through nonviolent, mass political protest and resistance. This isn’t hype. What took place at UCLA, the University of Chicago, in Washington, DC, in Berkeley and elsewhere are examples of how the courageous actions of a few—actions reflecting the real interests of the people and reaching out to mobilize them to fight—can break through the silence of normalization, present a challenge to those who feel the danger but are afraid to face the reality of the situation, and be a model for millions for how they should be acting. 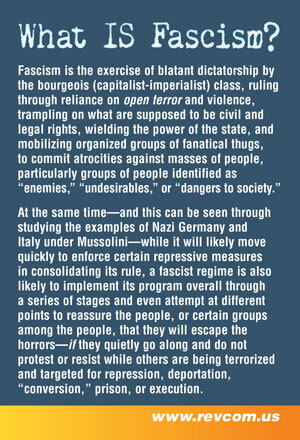 They can highlight and reveal the strategic weaknesses and vulnerabilities of these fascists—including that there are millions who hate them and can be inspired, and mobilizing determined resistance. And taking on these fascist assaults and attempts at political repression can be a key way resistance to the whole regime can and must be built.